A few weeks ago, we got our first look at Rising Thunder, a new robotic fighting game from Seth Killian’s Radiant Entertainment. Things move quickly these days, and Rising Thunder’s public alpha is now available. You can download the game from the Rising Thunder website and get into the action right now! And, in better-late-than-never style, Kotaku published an interview with Killian at the time of the game’s announcement wherein he describes his reasoning behind the game. 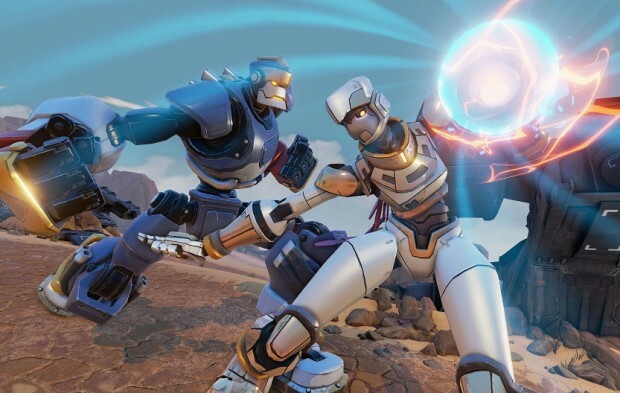 In essence, he wants to make Rising Thunder a more approachable fighting game — he understands that the time commitment required to master a fighting game is unrealistic for some players, and so Rising THunder will use one-button special moves, putting more of an emphasis on timing than on manual dexterity. Of course, that one out of 20 is going to scream at the top of his lungs about how you need to dedicate your soul to a fighting game, practicing for eight hours a day for six months until your fingers bleed if you want to be any good. The same thing was said about MMORPGs, first-person shooters, and all sorts of other types of games, and, well, you see how that’s gone. It’ll be interesting to see if Rising Thunder can usher in a new generation of more approachable fighting games. I look forward to the day when developers finally realize that dumbing down games doesn’t make them more fun. This actually makes me kind of sad, cause this game looked like it had a lot of classic fighter influence at first. I was looking forward to MvC where every character was Megaman. Too lazy to register and download. If it would be on steam or something but mehhh not going to register and download. Yeah, well. Fighting games are extremely different in that respect. In all those games you begin playing and then need to learn in order to get better. In fighters you won’t begin playing until you have learned the game. And how the hell do you do that as a new player if you need to play in order to learn, but at the same time need to learn first so that you can play? I think a barrier with a lot of fighting games is the multi-input move sets. Like quarter circle a be in one move, but semi circle a being a totally different move. Negating that barrier can easily change 1/20 to 2/20. At least in Rising Thunder the game has simpler controls without the need to input the ‘semi-circles’. The problem they will need to address is how it is easy to completely stun lock an opponent. Just a simple button and you are completely helpless. Then there is the issue of how two characters are just completely cheap to use. I mean I thought Scorpion in MKX was cheap but these two took the cake. They are just straight up brawlers that can stun lock you in a single move and then it is just spamming this one button until you are defeated.